This site is a reflection of my passion for observing and preserving this wonderful world, two-thirds of which is covered by water. Its my hope that these images help create an awareness of the oceanic environment, its inhabitants, and the fragile balance we must maintain as custodian's of these riches for generations to come. 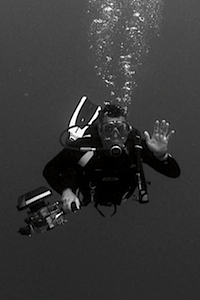 It is a personal journey through the wonderful world of scuba diving and underwater photography. All the photos on this site were shot personally and displayed in their original unaltered image. Thanks so much for visiting diveshoot.com! If you would like a print of any of these photos, simply email me and I will provide you additional details.